Planning a Project · Min Plastics & Supply, Inc.
Out of all the materials available to us today, plastics have a special role in accomplishing what others can’t and there are some limitations. So, you have an idea that could include fabrication (anything more than just a plain rectangle or circle). Here is some information you can provide so we can provide you a quote. DESIGN – we first need the design/drawing/sketch/idea on a piece of paper that represents what you want to create; a top view, side view and front view, if applicable. Other things to consider: are there shelves, hole sizes and locations, cutout sizes, removable items, do things need to fit inside and what are the dimensions of those things, do you need specific joints bent, what is the size of the thing you want to make (Length x width x height), specify either the outside measurement (OM) of an area or due to material thickness the inside measurement (IM) between two materials. TEMPLATES – if you still have the old piece, bring it to our showroom. OR you can make a paper/cardboard template. Use a ruler, protractor, or compass to make accurate lines. Write clear notes on your template if there are any specifics that need to be met. Double check your template fits as you like it. The better the template and details the better the final product will be. MATERIAL – will it be indoors or outdoors where sun will be on it, is the environment near an ocean or for marine use, is there radiated heat in the area warmer than you would like to touch, will object be prone to impacts, is weight and portability a concern, will light need to shine through or not at all, do you need to see though it or not? 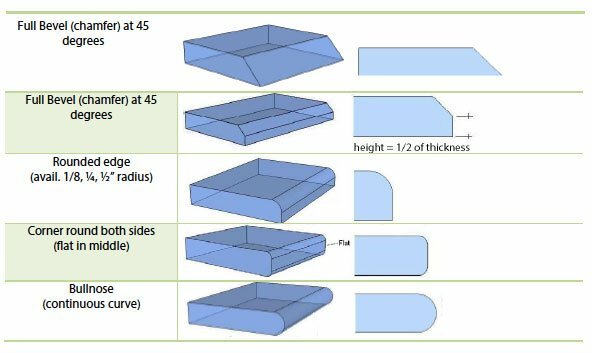 THICKNESS – most items can be fabricated with 1/8” to 3/8” thick material, but sometimes there may be a groove the plastic needs to fit into or an old thickness you need to match. Will the plastic bear weight, is there a span the item is being bridged, do you need a thicker luxurious look, how much flex is ok or not ok, will it be ok to add ribs to reduce flex in the product? FABRICATION – Fabrication projects are those that include either glue joints or strip bent joints. 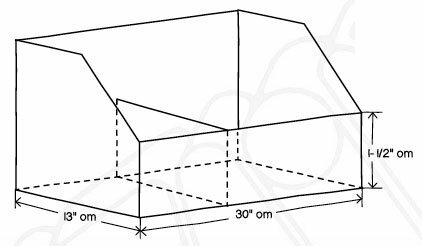 THERMOFORMING – will the piece need to be made out of one solid continuous piece, like a skylight. TUBES – have in mind the inside or outside tube dimension. How thick do you need the tube walls? EDGE FINISH –we offer 2 different edge finishes when fabrication is involved. Stage 3 (E-3) is our standard fabricated edge finish. This includes removing the rough saw tooth marks and replacing it with finer tool marks, then finally applying a glossy look. This improves the edge clarity and overall cosmetics of the piece to look finished. 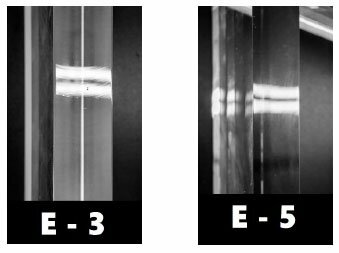 Stage 5 (E-5) is the second fabricated edge finish we offer includes everything in E3, PLUS fine sanding of all edge imperfections, then hand polishing sanded edges for a high gloss with minimal edge distortions finish. 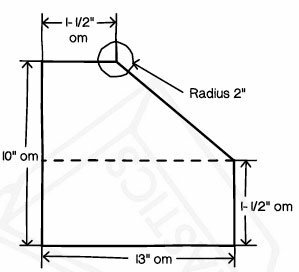 RADIUS CORNERS – have the square corners cut off to a specified radius of your choosing. SCREW HOLES – know the size of screw you will be using including the style or just bring in a sample. Will you need countersinks drilled, what is the screw’s shank diameter, do we need to add threads into the plastic?